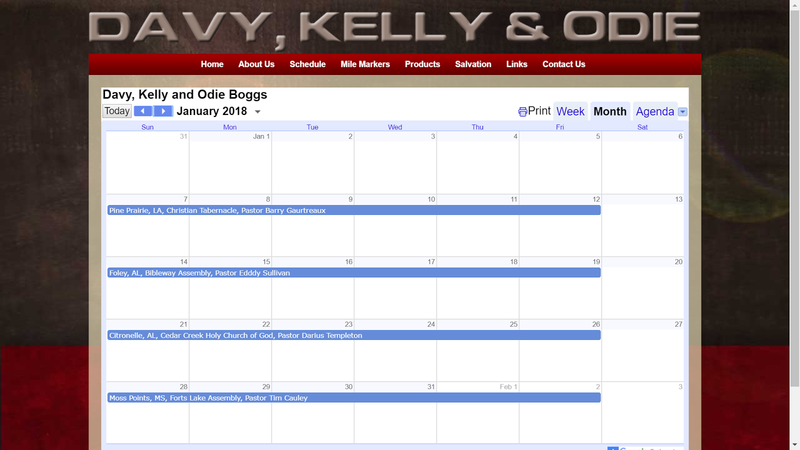 Most of you know that you can navigate to our full schedule right here at www.boggsblogs.com. The full desktop website looks the picture below. 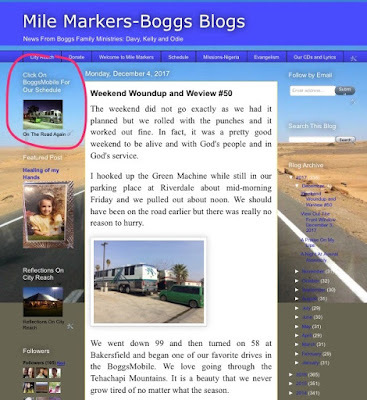 I have circled the BoggsMobile in red. If you go to the blog and click the picture in that circle, it will take you to our full schedule. Our mobile site is a little different. It does not have the sidebars or the tabs across the top. It does have a bar on top that says home. I have magnified it in the picture below. You can tap on that bar and it brings up a menu to scroll through. Click on schedule and it will take you to the schedule tab where you can click the link to go to the calendar. Either path brings up the calendar. I mention all of this because people that read the blog regularly often ask how to access the schedule. Now I can point them to this post and it will be easy-peasy. Speaking of schedule, I have pretty much added most revivals and tent revivals to the schedule for 2018. There are a few blank weeks but I am awaiting confirmation on exact dates and in some cases we are waiting for permits for tent revivals to finalize the date. We also have some exciting things shaping up for 2019. We are having some interest in City Reach for 2019 and we expect some more in the next few weeks. We will give you more information as we have it. Looking at dates a little closer to us, we have a change the latter part of this week. Many of you may remember we conducted a service in a park to help introduce a weekly Bible study with Bro. Trey Dickerson while we were in Phoenix in spring of 2016. They began Bible study and it is my understanding they began holding church services a few months later. Several of you have asked me this year how the church is doing and I know that some of you have been praying for several months about the service there this coming Saturday night. Bro. Trey contacted me Sunday and said they were not able to get things together in time. We will get to see them and their people at Desert Cove next week though. Hey, maybe you can come to Desert Cove as well. We would love to have you. Thank you for reading today.